(Nanowerk Spotlight) Surface energy is ubiquitous in nature and it plays an important role in many scientific areas such as for instance surface physics, biophysics, surface chemistry, or catalysis. Prior to the area of nanotechnology it has been impractical to consider utilizing surface energy as an energy source because there are few molecules or atoms involved in the surface interaction and the density of surface energy is low. Now, however, due to the lower power consumption requirements of nanoscale devices and the higher specific surface area for nanomaterials it appears attractive to use surface energy at the nanoscale. A team led Rensselaer Polytechnic Institute Professor Nikhil Koratkar investigated how the flow of water over surfaces coated with graphene, rather than carbon nanotubes, could generate small amounts of electricity. 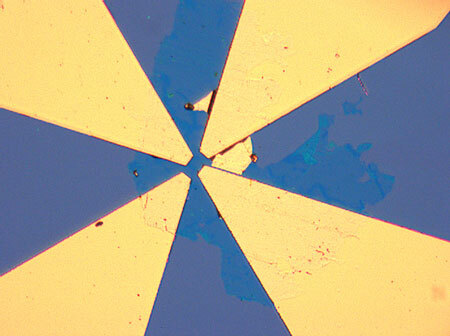 "We find that water flow over a small graphene fragment generates a potential difference between the two ends of the fragment" Koratkar tells Nanowerk. "This induced voltage can be as high as 30 milli-volts. When we connect a resistor across the graphene fragment we can generate up to 85 nano-watts of power at a flow velocity of 1 cm/sec." Published in the July 12, 2011 online edition of Nano Letters ("Harvesting Energy from Water Flow over Graphene"), this is the first report showing that water-flow over graphene can be exploited to harvest energy from the fluid motion. Koratkar explains that the mechanism behind this effect is adsorption of chloride ions present in water on to the graphene film surface. "Friction between this adsorbed surface layer with the bulk flow results in the adsorbed chloride ions acquiring a net drift velocity in the direction of the flow," he says. "These ions in turn couple with the free charge carriers in graphene and drag them in the flow direction resulting in a potential difference across the graphene fragment." Although similar studies have been performed with carbon nanotubes, the Rensselaer team finds that graphene is far more effective than carbon nanotubes at harvesting energy from the flow. The only limitation is that the graphene coating requires ions to be present in water to function properly. According to the researchers, there are many reasons for this. But the main ones are that a nanotube film contains both metallic and semi-conducting tubes which lowers the density of available free charge carriers in the sample. Also electrons and ions drifting along the nanotube film must hop or jump across the nanotube-to-nanotube interfaces which is inherently a lossy process. "In our case, we have a continuous graphene sheet that spans the entire gap between the electrodes which no physical breaks or interfaces between sheets which makes the process much more efficient" explains Koratkar. An example of how this concept could be used is to power tiny sensors that are introduced into water or other fluids and pumped down into a potential oil well. As the injected water moves through naturally occurring cracks and crevices deep in the earth, the sensor devices detect the presence of hydrocarbons and can help uncover hidden pockets of oil and natural gas. As long as water is flowing over the graphene-coated sensor devices, they should be able to provide a reliable source of power. This power is necessary for the sensors to relay collected data and information back to the surface. "Basically any situation where an ionic fluid is moving past a stationary surface can be exploited for power generation if the surface can be coated with graphene" Koratkar points out. "The result would be a self-powered, autonomous microsensor. We'll wrap the graphene coating around the sensor, and it will act as a 'smart skin' that serves as a nanofluidics power generator." Before you can expect self-powered microrobots or microsubmarines to roam through our water supplies, the researchers need to deal with the issue of scalability – how does the power scale with the size of graphene? "The graphene fragments that we tested were 0.03 mm by 0.016 mm" says Koratkar. "It remains to be seen how efficient this process is for larger graphene films for which sheet-to-sheet interfaces might reduce the effectiveness of the process."